The sustained rebound in the real estate market and increase in home prices over the course of 2017 has resulted in higher conforming loan limits for 2018. For the second year in a row, the Federal Housing Finance Agency (FHFA), the government agency that sets the conforming loan limits, announced an increase in loan limits for the coming year. This is only the second time since 2006 that the FHFA raised conforming loan limits, reflecting the overall health of the real estate market as well as improving property values. In fact, the general 2018 conforming loan limit for a single unit property increased by 6.8%. The 2018 conforming loan limits are important because they help determine your mortgage rate and eligibility for certain no or low down payment mortgage programs. In short, loan amounts that are below the conforming loan limits typically qualify for lower mortgage rates and are eligible for home buyer assistance programs. So the higher 2018 conforming loan limits are positive for borrowers, especially as property values continue to climb. The 2018 conforming loan limits go into effect on January 1, 2018. 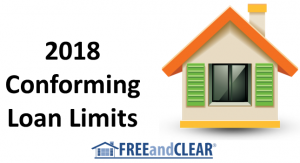 Below, we summarize the loan limit changes and summarize the FREEandCLEAR tools you can use to determine the 2018 conforming loan limit for your county. Please note that there is one set of conforming loan limits for the contiguous United States, District of Columbia and Puerto Rico and a higher set of loan limits for Alaska, Guam, Hawaii and the U.S. Virgin Islands. Additionally, within each geographic classification there is a general conforming loan limit and high cost area conforming loan limit for properties located in counties with higher property values. The conforming loan limits also vary by number of units in the property, ranging from one unit to four units. In the contiguous United States, Washington D.C. and Puerto Rico, the general conforming loan limit for a single unit property increases from $424,100 to $453,100 in 2018. The general 2018 conforming loan limit for a four unit unit property increases from $815,650 to $871,450. The table below compares the general 2018 conforming loan limits to the 2017 loan limits. In the contiguous United States, Washington D.C. and Puerto Rico, the high cost area conforming loan limit for a single unit property increases from $636,150 to $679,650 in 2018. The high cost area 2018 conforming loan limit for a four unit unit property increases from $1,223,475 to $1,307,175. The table below compares the high cost area 2018 conforming loan limits to the 2017 loan limits. The conforming loan limits for Alaska, Hawaii, Guam and the U.S. Virgin Islands are higher than the loan limits for the contiguous United States. In Alaska, Hawaii, Guam and the U.S. Virgin Islands the general conforming loan limit for a single unit property increases from $636,150 to $679,650 in 2018. The general 2018 conforming loan limit for a four unit unit property increases from $1,223,475 to $1,307,175. The table below compares the general 2018 conforming loan limits to the 2017 loan limits. In Alaska, Hawaii, Guam and the U.S. Virgin Islands, the high cost area conforming loan limit for a single unit property increases from $954,225 to $1,019,475 in 2018. The high cost area 2018 conforming loan limit for a four unit unit property increases from $1,835,200 to $1,960,750. The table below compares the high cost area 2018 conforming loan limits to the 2017 loan limits. As always, all the FREEandCLEAR resources are free to use. We encourage you to use our tools to understand how the 2018 conforming loan limits apply to you.